Summer means different things to different people, but as a teen (before I was old enough to get a job) summer was the time I got to do the things I really wanted to do and learn. I took ceramics classes and learned to swim and read the books that I wanted to read. I also came up with all sorts of crazy projects, like tearing apart my bike and rebuilding it as a lowrider chopper. One summer, I made what I called 'ramps' which, essentially, was a marble roller coaster. Through trial and error I learned about drops and turns, what worked and what didn't, and had a great time figuring out what sort of things I could recycle into my amusement. Who knew I was learning physics in the process? 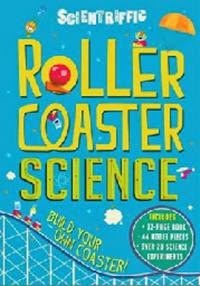 While Roller Coaster Science hews toward tweens who might be only vaguely familiar with the concepts and principles involved, the text is friendly without being condescending to more knowledgeable readers. Each spread introduces a concept -- acceleration, force, mass and weight, etc -- along with an experiment to demonstrate how it works. Or doesn't work as the case may be. The back half of the book includes pre-printed paper ramps to punch out and assemble. Build the coaster according to directions, get a marble, and let it rip! Then get some paper towel rolls, funnels, old garden hoses, scraps of wood, whatever you can get you hands on and go crazy with some "practical" physics!